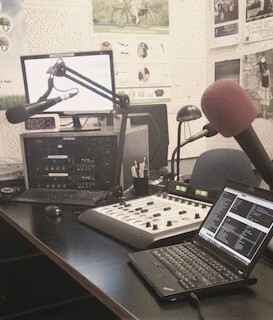 The beauty about community radio is it gives a real opportunity to those otherwise might not get to sit behind the mic and broadcast their show to the local community (and often overseas too, with the addition of online streaming). A lot has been said about why community radio is valuable to Australia and why funding should continue. I’m a big fan of the effort to continue to promote the need to have bandwidth and grants for more than just commercial and public broadcasters. Say you’re lucky enough to land a fill-in gig on a local community radio station. You throw together a show, make a bit of a mash of the levels, use dead air heavily and generally make a mock of it all. Your show is really pants. Here’s what you can do to make it better. When I started out just over 4 years ago, I was a giggler. It was unstoppable. My co-host, who has a serious collection of Dad jokes and old cardies, seemed to make me laugh all the time I was on air. It was probably to do with nerves mostly, which fades with time and experience. But my first tip is listening to yourself. Grab a recording of your show, whether it is your first, latest, whatever, it doesn’t matter. Listen to the whole show. Thankfully, along with the nerves, this also gets better over time. It’s a bit like watching yourself being recorded on film. It just feels really awkward and you don’t want to watch any more. But with radio, at least you can relax while the music is playing. That comes to the next bit. What format is the show you are trying to broadcast? I’ve basically done a music-oriented show and that’s about it for all of my shows. Couldn’t quite land any famous people to interview and any friends that I dragged along to the studio seemed to have only one-word answers for all of my questions. Dead air. Sounds bad doesn’t it? OK, so you’ve got that. What’s next? CD CDs are pretty reliable, espcially if they are pressed from the factory. Burnt ones not so much. If I was bringing burnt CDs with a compilation of different tracks to play to air, then I’d bring in 2 copies just in case. It also makes it easier to swap from one CD deck to the other in a bit of odds and evens kind of fashion. CDRW I found were useful for reducing landfill (burning 2 CDs every week sure uses them up quickly) but they did take a long time to burn. MD Ahh the MiniDisc. My personal favourite due to the toughness of the media and also the old school retro feeling. Although they aren’t all that old really. We still use them from time to time on our show, particularly for things that we’ve recorded at home. They just seem to keep working and keep working forever. Vinyl Vinyl is great. Sounds great, you can turn it up loud, it has that nice occasional crackle and there are STACKS of it around. In fact vinyl sales have been on the up in recent years, so expect to see the format sticking around for a while longer. You could even get inspiration from the format and do a vinyl-only show. Having 2 turntables is also nice so you can mix from one track into another when you are feeling a bit more adventurous. Turn off ALL system sounds. And I mean all of them. Nothing worse than broadcasting an “Uh oh” sound in the middle of a song. Ensure the volume of the PC is up to max before unmuting the PC channel. This is especially relevant for Macs because they make an annoying “Wharmp” sound as the volume is increased. Not something you want on air. Use a player that supports ReplayGain with it set to “gain and clip according to track peak”. Make sure all of the tracks you are going to play have been analysed with ReplayGain. This basically means all songs will sound the same level of volume without you having to do much at all. Once you get the level right on the board for the “PC” input channel, then it’s all sweet. Don’t use the PC for anything else while music is playing. You never know when it’s going to stuff up and even for a slightest second pause your currently playing song! Use the best quality tracks. 128kbps MP3 does NOT cut it. You can really tell over the radio. Youtube This should only be used as a last resort. I actually really hate using Youtube becaus the quality is just so variable and unknown. And when bad quality audio gets broadcast on air, it sounds EXTRA bad. So maybe avoid this one unless it’s the only place you can find the track and the quality sounds OK when you run it through the preview. The Studio Phone At this stage, I wouldn’t even bother with taking calls and putting them to air. Every studio is different so I can’t say exactly how to use the phone here, but it does take a more advanced level of panel operating so I’ll leave it at that for the moment! Other options You can use your phone. A portable MD player. Or bascially anything else with a 3.5mm headphone jack on it. Social Media I’m going to finish up this one soon because it’s getting a bit long. But the last point I want to cover today is social media. Twitter is HUGE in radio. Use it to promote your show. Use all channels possible. I’ve even posted up to LinkedIn and got a few listeners through that. Tell everyone you are on the air and if they like your show they will be back again. However, everyone is busy so they need reminding of when the show is on. Just a few minutes before the show starts is a great time to promote. I think I’ll save some more tips for a part 2 blog. I require a valid email address. Please check your details and try again.